Ushikubo loves to perform in a variety of settings. In August 2015, he made a special appearance as piano and violin soloist in a concert presented by Grand Performances in Los Angeles. The program featured Ushikubo performing traditional classical works alongside jazz pianist Alfredo Rodriguez and electronic musician Daedalus, who “remixed” improvised versions of the classical works, crossing the genres of classical, electronic music, and jazz. He has performed as violin soloist in the Los Angeles Chamber Orchestra’s 2014 Gala "StradFest," with the New West Symphony as part of their Symphonic Adventures Program, and for the opening concert of the 2017 La Jolla Music Society SummerFest. He performed as piano soloist at the Los Angeles Japanese American Cultural & Community Center (JACCC) for a peace ceremony honoring Hiroshima atomic bomb victims, which also featured the acclaimed singer-songwriter Jackson Browne. He has appeared as guest artist on Rob Kapilow’s What Makes It Great? series at the Cerritos Center for the Performing Arts, on San Diego’s Mainly Mozart’s series Mozart & the Mind, at the Griffith Observatory as part of the Los Angeles Philharmonic’s Immortal Beloved celebration, where he performed Beethoven’s Moonlight Sonata. A 2014 Davidson Fellow Laureate, Ushikubo was awarded $50,000 by the Davidson Institute for his music project “Circle of Life in Music.” Having won the 2017 Hilton Head International Piano Competition and the 2016 Piano Concerto Competition at the Aspen Music Festival and School, he has also won first prize at the 2015 Steinway Concerto Competition, the Young Artists Piano Prize at the 2013 Mondavi Young Artists Competition, and the 2012 Steinway Prize for the best performance of a Beethoven Sonata. 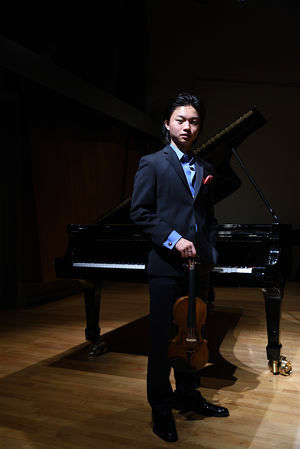 Ushikubo will start his Bachelor’s degree at the Curtis Institute of Music, where he will study piano with Gary Graffman and Robert McDonald and violin with Aaron Rosand and Midori. Ushikubo's other interests include automobiles, classic action movies, and classic heavy metal music. Biography current as of July 2018. Please refer only to this version of Ray Ushikubo’s biography and destroy any previous versions.